CHARLESTON, W.Va. — Senator Mark Maynard, R-Wayne, sparked debate today at the Senate Judiciary Committee meeting when he proposed an amendment to SB 261, dealing with county magistrates. Janie Moore, director of Magistrate Court Services, speaks to the W.Va. Senate Judiciary Committee on SB 261. WV Press Photo. 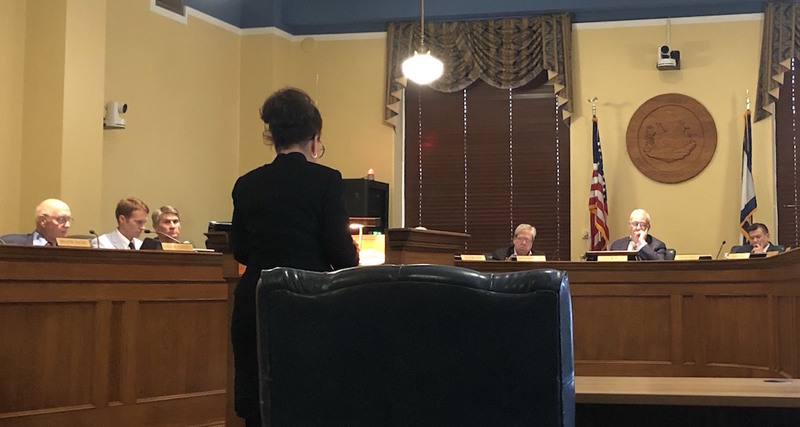 The bill is aimed to change the number of magistrates serving in some West Virginia counties and states that McDowell county would sit two magistrates instead of its current three, but Maynard’s amendment would eliminate this and allow the county to keep three magistrates. Maynard said he felt it would help the already struggling county. Earlier in the meeting, Maynard questioned Janie Moore, director of Magistrate Court Services, as to why McDowell County would be losing a magistrate, citing the poverty levels and opioid epidemic in the area as reasons for why this should not happen. Moore said that the caseload had dropped between 2017 and 2018, but pointed out that it is technically the legislature who has the power to decide how many magistrates should serve in each county. She also said that the legislature is in charge of deciding when it is necessary to add or remove magistrates from a given county and the courts do not typically give their input on this unless asked. Sarah Canterbury, counsel to the Judiciary Committee, said constitutionally, the legislature has the authority to decide the number of magistrates, but a bill was passed in 2000 giving the courts that authority. Some senators openly disagreed with the amendment, namely Senator Ryan Weld, R-Brooke, who said he feels sympathy for those in McDowell County, but he does not feel as if another magistrate would drastically change the caseloads. At the conclusion of the meeting, the committee voted on the amendment. After an 8-8 tie, Maynard’s amendment did not pass. McDowell County male life expectancy lowest in US.